On the heels of successful pop-up events in Cedar Park, TX, and Palm Beach Gardens, FL, the national tour, which was announced last year, will continue on August 10 in Richmond and will go through 2018, bringing Sue’s Tech Kitchen to a total of nine US cities, five of which are in partnership with ShopCore Properties. 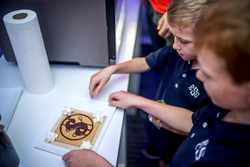 Experiences will include fan favorites, such as 3D Printed S’Mores, Coding With Candy and a Subzero Stand teaching the science of liquid nitrogen, as well as brand new features, such as RoboKitchen, Drone Drops, and more. Sue's Tech Kitchen will also celebrate the arts as a valuable component of education by collaborating with Davenport Theatricals to present a 360 virtual reality experience of their latest production, Once on This Island, winner of the 2018 Tony Award for Best Revival of a Musical. VR technology will place participants centerstage to discover the Broadway production's in-the-round power. To further enhance the STEM-infused experience, Sue’s Tech Kitchen will continue to celebrate local tech luminaries as part of their ongoing effort to promote nationwide innovation. Zuckerberg Media and Sue's Tech Kitchen inventors and leaders will be on-hand to greet audiences and discuss the future of tech with local STEM enthusiasts. Sue’s Tech Kitchen is proud to work with local innovators, from entrepreneurs to tech giants. If you or your team would like to partner with Sue’s Tech Kitchen, please contact us at sue(at)zuckerbergmedia(dot)com. A Harvard graduate, Randi hosts a weekly talk business talk radio show, Dot Complicated on SiriusXM. She has two TV shows currently on air: DOT on NBC Universal Kids (winner of Kidscreen's Best New Preschool Series) about a spunky little girl who uses tech to enhance her everyday adventures, and American Dreams on HSN, highlighting entrepreneurs around the country. She is the New York Times best-selling author of Dot Complicated, Dot., Missy President, and most recently, Pick Three. ShopCore Properties owns and operates over 24 million square feet of retail space across the US. Their assets are concentrated in densely populated markets and are anchored by best-in-class retailers. They currently have significant holdings in California, Florida, Texas, New York and Pennsylvania. West Broad Village is a lifestyle center located in Glen Allen, Virginia featuring a unique collection of shops and restaurants, including Whole Foods Market, HomeGoods, REI and many more. Accented by an abundance of signature events, family-oriented activities, pet friendly atmosphere, and so much more, West Broad Village is a favorite in Glen Allen, Virginia. The stylish venue, conveniently located minutes from Downtown Richmond, Virginia, features a collection of exclusive experiences  such as Mona Cigar Lounge, Spirited Art, and All Fired Up. Bonefish Grill, Dave & Buster’s and Kona Grill are among nearly a dozen restaurants sure to please any palate. Whether you are local or just visiting, discover something special at West Broad Village!